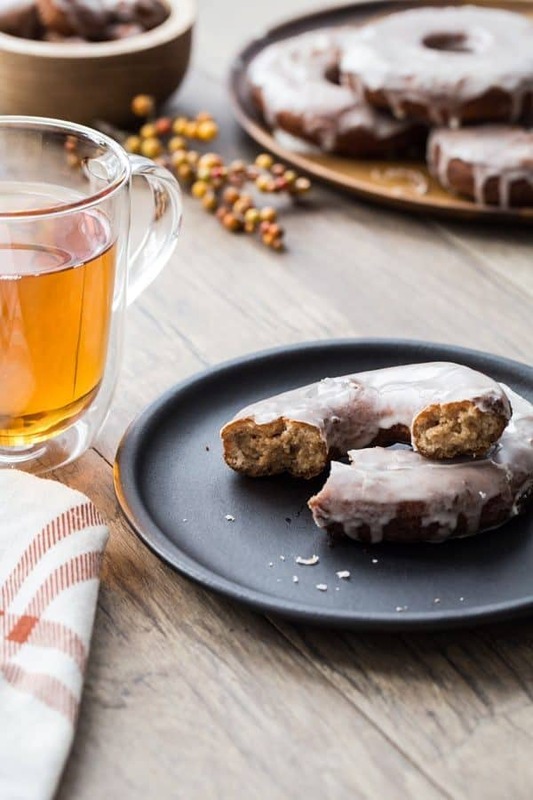 Apple Cider Donuts are loaded with delicious fall flavors. Celebrate the season with this old-fashioned treat the whole family will adore! This post is sponsored recipe development on behalf of Crisco®. All opinions are my own. Thank you for continuing to sponsor the brands that make My Baking Addiction possible. It’s finally chilly here in Ohio, which means it’s almost time for sweater weather, fall decorating, and pumpkin spice everything. I may have jumped the gun and put out all my fall decor weeks ago, but I’m so glad it’s finally appropriate now. I couldn’t wait anymore! One of my absolute favorite things about fall is our annual trip to the orchard. We round up the family to spend the afternoon together picking apples, going on hay rides, and winding our way through the corn maze. 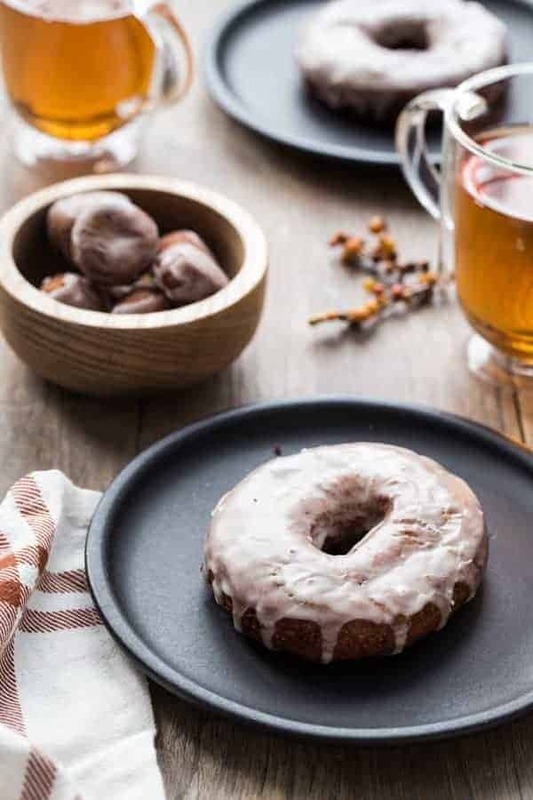 And although I adore all of those things, my absolute favorite thing about our day at the orchard are warm apple cider donuts served up with a piping hot cup of spiced cider. 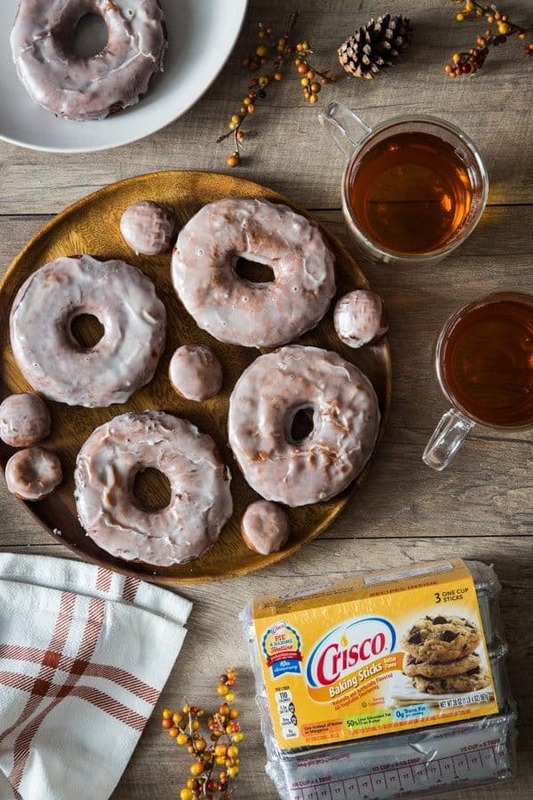 When Crisco asked me to collaborate with them to share a delicious fall recipe, creating a version of those magical apple cider donuts in my own kitchen was a no-brainer. Something we can enjoy long after orchard season has passed. After a lot of trial and error, I think I’ve come up with a scrumptious recipe that is full of fall flavor. Judging from Eric and Elle’s inability to stop devouring them at record speed, I think your family will agree. The secret to apple cider donuts is boiling high quality apple cider until it becomes syrup-like in texture. This process really concentrates the rich, deep flavors of the cider and makes for an ultra-flavorful donut. 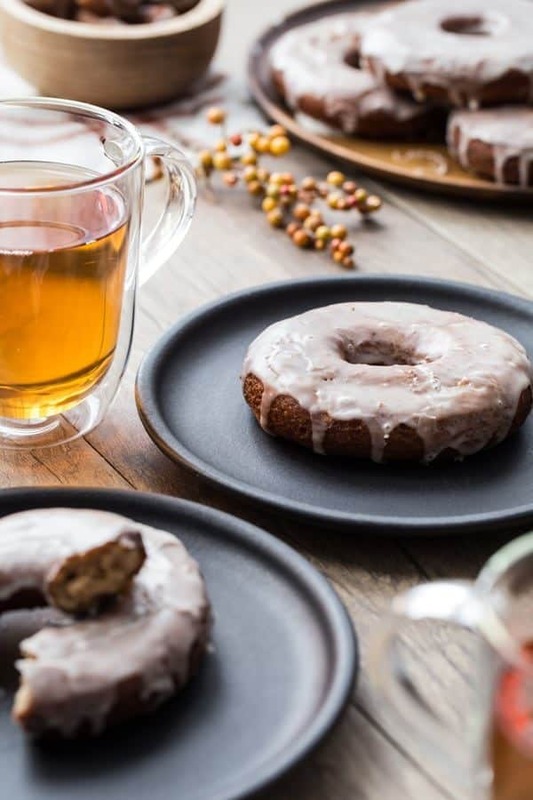 And although these donuts are pretty great with a toss in cinnamon sugar, I had to take them a step further by dipping them into an apple cider glaze. The texture of these donuts is absolute perfection, I have to tell you. They’re light and fluffy, and perfectly tender. They keep their texture for several days, and make a wonderful fall breakfast several days in a row, especially with coffee or tea on a chilly morning. There’s just something so amazing about finally cracking one of your favorite recipes for yourself. When you figure out the ingredient that did it, you just want to kiss the packaging. Kidding. But kind of not. You might be thinking, oh, but she’s frying! That’s scary! I have to tell you, though, these delectable cake-like donuts are actually way easier than you’d think. All that frying really needs to be easy is some prep work to set up your assembly-line. With your oil ready to go, tools for flipping and pulling the donuts from the pan, and paper towel ready for draining, it becomes as easy as 1-2-3. 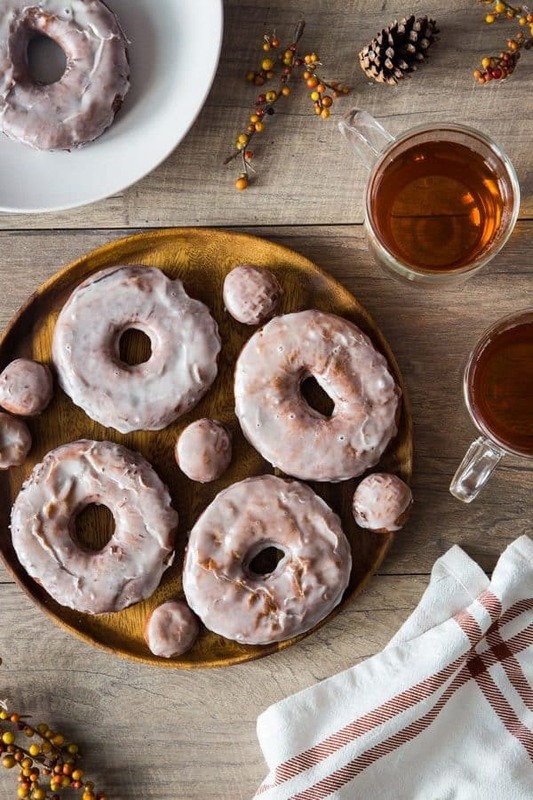 These sweet apple donuts are everything you want in a fall treat. Whip them up before a chilly day out enjoying the last of fall’s colors, or make them at night to go with a fun fall movie and some popcorn. I’ll be the first to admit my copy of Hocus Pocus has been on repeat for weeks, and we’re not stoppin’ just because Halloween has been and passed. I can’t imagine a more cozy evening! 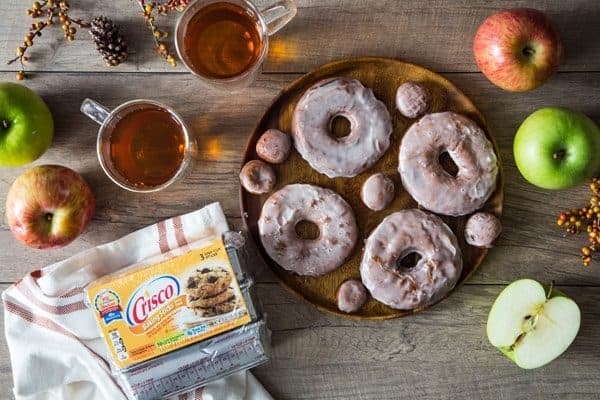 For more delicious recipes using Crisco®, be sure to check out this Chocolate Coconut Zucchini Bread and these Apple Hand Pies! Visit Crisco.com or search #CriscoCreators on social media to find more great recipes! If you need help with your holiday baking this year, the Crisco® Pie & Baking Hotline is a great one-stop resource. Just call 1-877-367-7438 for real-time expert advice and tips for all your baking needs. BOIL apple cider in a saucepan over medium heat until it is reduced to 3/4 cup. Cool completely. COMBINE 2 cups flour with sugar, baking powder, baking soda, cinnamon, salt, nutmeg, 1/4 cup shortening, buttermilk, eggs, vanilla and 1/2 cup reduced and cooled cider; beat at low speed with an electric or stand mixer until blended. BEAT at medium speed for 2 minutes. Stir in remaining flour. DIVIDE dough in half. Sprinkle lightly with flour. Roll each half to slightly less than 1/2-inch thickness on well-floured board. Cut with a floured 2 3/4 to 3-inch donut cutter. Reserve donuts holes. HEAT 2 inches oil to 350°F in deep fryer or deep saucepan. COMBINE powdered sugar, reserved 1/4 cup reduced and cooled cider, and 1 tablespoon of milk in small bowl; stir until smooth. If the glaze is too thick, gradually add in more milk one teaspoon at a time to thin it out a bit. DIP tops of doughnuts in glaze. Invert on wire racks until glaze is set. Oh my word! These look insanely delicious and I can’t wait to try them. Donuts, why must you tempt me with your utter perfection????? Haha, these look delish! I’m GLAD you fried the donuts. I get so sick of of these lettuce eaters trying to ruin everything we eat. They already destroyed McDonald’s French fries. Most of the world didn’t know that years ago, when they tasted FAR better, McDonald’s used beef talo to make the french fries. Having these types of “fats” is only dangerous if you live on it. Fast food was never intended to be consumed 5 to 7 days a week. At least they still have their special potatoes. Most never realize McDonald’s has the rights to a unique variety of potato they use for their french fries. They pay farmers to grow them and ONLY for them. They’re an industry secret. Its one reason their fries are the best in the fast food business, even without the beef talo. Even their ketchup is a special blend just for them. All of this is why no one can replicate them at home. But back to donuts….. Once a year, Fasnacht Day (donut day to many of you) my great-grandmother would begin about 3 am making fasnachts. When my mother dropped me off around 6 am the first ones were coming out of the electric skillet. She liked to have some ready so my mom could take some along. They would use this wonderful heavy electric skillet (which disappeared somehow after my great aunt’s death which is a shame) with a couple inches of Crisco. Once they were finished and still very warm we would drop a couple in a brown lunch bag with powdered sugar and shake. I can’t begin to describe how incredibly delicious they were. I’ve NEVER had ones as good since her death. There are some things that you just can NOT “healthify” and something like these donuts are one of them. It goes against the laws of nature. And I had several people in my family who lived mostly all of their lives on things that would make vegans, vegetarians and health nuts go screaming into the night live to well into their 90s. Want to know the common thread, lots of fresh homegrown food, including lots of fruits and vegetables (and not this stuff from a supermarket), most did give up the cans of lard in the 60s though (I was glad, I hate that film lard leaves in your mouth), no smoking, little or no alcohol (this is fine in moderation), and lots of hard work. There wasn’t a couch potato in the lot. In fact, their health never declined until physically they couldn’t work like they did. It was being sedentary that eventually killed them, NOT eating some fried foods. I’m also glad to see how you used the cider. Sadly cider just isn’t the same as it was years ago because they have to atomize, pasteurize and homogenize it and who knows what else just like milk. They’ve “ized” much of the flavor right out of it. That happened back in the 60s or 70s I think. It greatly upset many of the apple growers where I live. I live right smack in the middle of orchard country in Maryland. Concentrating the flavor by doing a reduction is an excellent way to counteract this loss of flavor. If you watch “The Great British Bake Off” one of the participants did this for flavorings she used in a bake. Hi, Ruth! 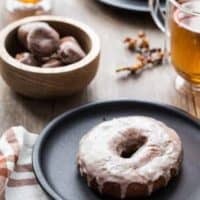 I honestly don’t really know how to make these gluten free, but there are some tips on several sites giving advice. If you try these gluten free, let me know how you like them! Good luck! When you mention Apple Cider in the recipe, is i Apple Cider Vinegar? Can Apple juice be used instead? Hi, Shabina! No, it is not apple cider vinegar. Apple cider is made from extracting the juice from apples, whereas apple juice adds sweeteners and preservatives. I would not recommend using apple juice in this recipe. Let me know if I can help you with anything else!